Only once in a blue moon, any player achieves this sort of a record. While there are many instances of a bowler picking up 10 wickets in an innings of a match in the history of cricket. Here is my top 5 pick of this rare feat. Everyone knows about the 10-wicket haul that Anil Kumble took against Pakistan at the Ferozshah Kotla Stadium. It is an incredible feat for any bowler to achieve regardless of the format and the competition he is playing in. Here is this list we will be discussing other players who have been able to achieve similar kind of feat across the world in different formats. The Englishmen achieved this great feat back in the year 1956 and that too in the Ashes. It can’t get bigger than this for any English player as this was against the mighty Australians. This was the fourth Test match of the series which was played in Manchester. In the first innings, England score 459 runs with the help of two centuries from Richardson and Sheppard. Australia wouldn’t have thought this even in a nightmare. They were bowled out for just 84 runs in the first innings were asked to follow-on. 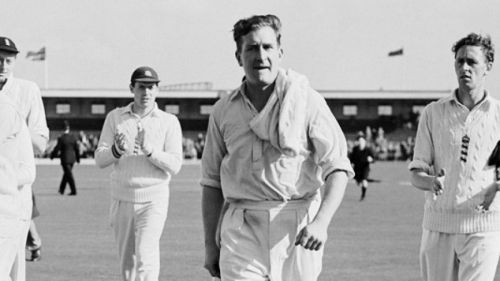 Thanks to Jim Laker’s 9 wickets which helped England to wrap the Australians so early. Second Innings had something special in store for Jim Laker as he went on to become the first bowler in the history of International Cricket to take 10 wickets in an innings. He completed with a figure of 51.2-23-53-10. He took a total of 19 wickets in the match which is still a world record for most no of wickets in a single Test match. England won the Test match by an innings and 170 runs on 31st July 1956.